NASA’s Global Hawk being prepared at Armstrong to monitor and take scientific measurements of Hurricane Matthew in 2016. Credits: NASA Photo/Lauren Hughes. A group of NASA and National Oceanic and Atmospheric Administration (NOAA) scientists, including scientists from NASA’s Jet Propulsion Laboratory, Pasadena, California, are teaming up this month for an airborne mission focused on studying severe storm processes and intensification. The Hands-On Project Experience (HOPE) Eastern Pacific Origins and Characteristics of Hurricanes (EPOCH) field campaign will use NASA’s Global Hawk autonomous aircraft to study storms in the Northern Hemisphere to learn more about how storms intensify as they brew out over the ocean. The scope of the mission initially focused only on the East Pacific region, but was expanded to both the Gulf and Atlantic regions to give the science team broader opportunities for data collection. “Our key point of interest is still the Eastern Pacific, but if the team saw something developing off the East Coast that may have high impact to coastal communities, we would definitely recalibrate to send the aircraft to that area,” said Amber Emory, NASA’s principal investigator. Having a better understanding of storm intensification is an important goal of HOPE EPOCH. The data will help improve models that predict storm impact to coastal regions, where property damage and threat to human life can be high. 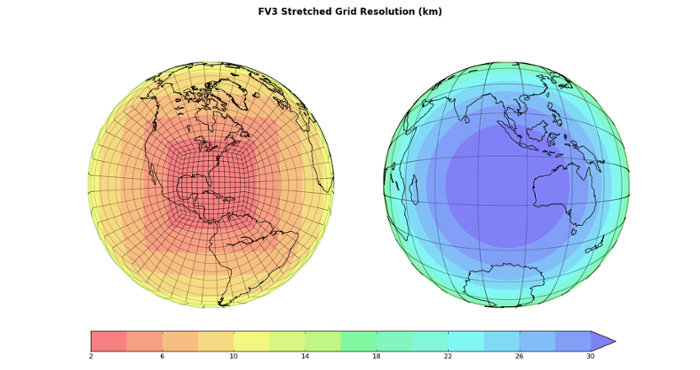 NASA has led the campaign through integration of the HOPE EPOCH science payload onto the Global Hawk platform and maintained operational oversight for the six planned mission flights. NOAA’s role will be to incorporate data from dropsondes — devices dropped from aircraft to measure storm conditions — into NOAA National Weather Service operational models to improve storm track and intensity forecasts that will be provided to the public. NOAA first used the Global Hawk to study Hurricane Gaston in 2016. With the Global Hawk flying at altitudes of 60,000 feet (18,300 meters), the team will conduct six 24-hour-long flights, three of which are being supported and funded through a partnership with NOAA’s Unmanned Aircraft Systems program. NASA’s autonomous Global Hawk is operated from NASA’s Armstrong Flight Research Center at Edwards Air Force Base in California and was developed for the U.S. Air Force by Northrop Grumman. It is ideally suited for high-altitude, long-duration Earth science flights. The ability of the Global Hawk to autonomously fly long distances, remain aloft for extended periods of time and carry large payloads brings a new capability to the science community for measuring, monitoring and observing remote locations of Earth not feasible or practical with piloted aircraft or space satellites. 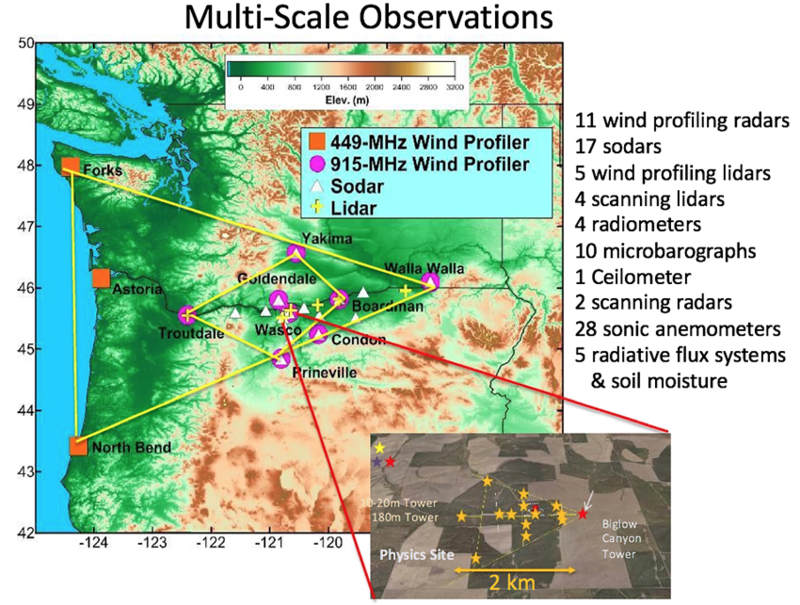 The science payload consists of a variety of instruments that will measure different aspects of storm systems, including wind velocity, pressure, temperature, humidity, cloud moisture content and the overall structure of the storm system. Many of the science instruments have flown previously on the Global Hawk, including the High-Altitude MMIC Sounding Radiometer (HAMSR), a microwave sounder instrument that takes vertical profiles of temperature and humidity; and the Airborne Vertical Atmospheric Profiling System (AVAPS) dropsondes, which are released from the aircraft to profile temperature, humidity, pressure, wind speed and direction. New to the science payload is the ER-2 X-band Doppler Radar (EXRAD) instrument that observes vertical velocity of a storm system. EXRAD has one conically scanning beam as well as one nadir beam, which looks down directly underneath the aircraft. EXRAD now allows researchers to get direct retrievals of vertical velocities directly underneath the plane. 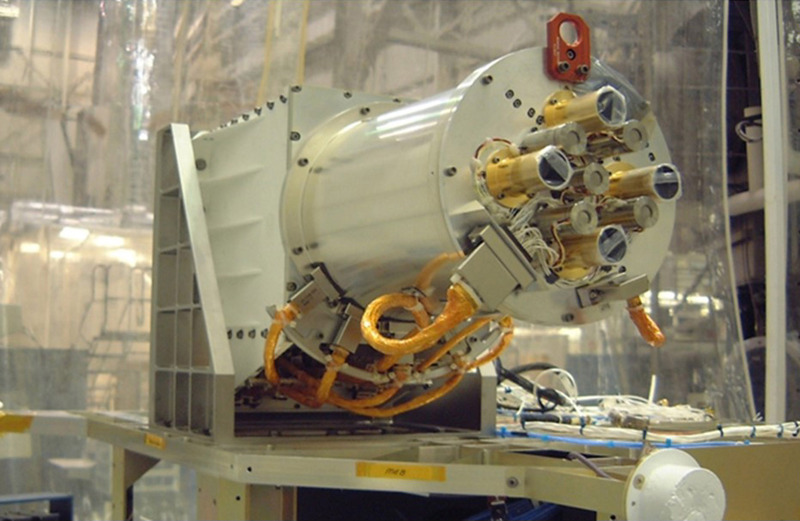 The EXRAD instrument is managed and operated by NASA’s Goddard Space Flight Center in Greenbelt, Maryland; and the HAMSR instrument is managed by JPL. 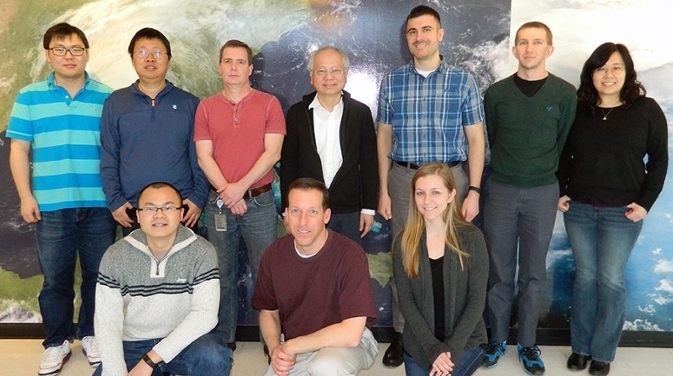 The National Center for Atmospheric Research developed the AVAPS dropsonde system, and the NOAA team will manage and operate the system for the HOPE EPOCH mission. Besides the scientific value that the HOPE EPOCH mission brings, the campaign also provides a unique opportunity for early-career scientists and project managers to gain professional development. HOPE is a cooperative workforce development program sponsored by the Academy of Program/Project & Engineering Leadership (APPEL) program and NASA’s Science Mission Directorate. The HOPE Training Program provides an opportunity for a team of early-entry NASA employees to propose, design, develop, build and launch a suborbital flight project over the course of 18 months. This opportunity enables participants to gain the knowledge and skills necessary to manage NASA’s future flight projects. Emory started as a NASA Pathways Intern in 2009. The HOPE EPOCH mission is particularly exciting for her, as some of her first science projects at NASA began with the Global Hawk program. The NASA Global Hawk had its first flights during the 2010 Genesis and Rapid Intensification Processes (GRIP) campaign. Incidentally, the first EPOCH science flight targeted Tropical Storm Franklin as it emerged from the Yucatan peninsula into the Gulf of Campeche along a track almost identical to that of Hurricane Karl in 2010, which was targeted during GRIP and where Emory played an important role. GOES-16 captured this view of the moon as it looked across the surface of the Earth on January 15, 2017. Like earlier GOES satellites, GOES-16 will use the moon for calibration. Image via NOAA/NASA. 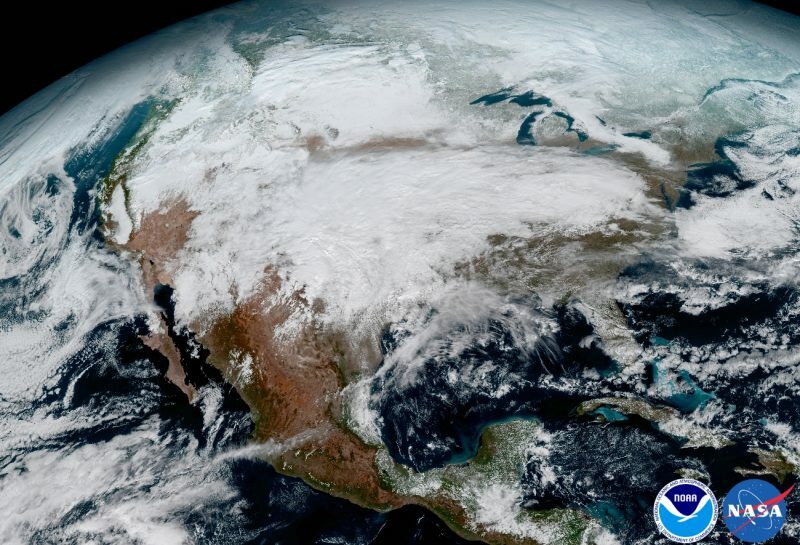 This GOES image shows the significant storm system that crossed North America that caused freezing and ice that resulted in dangerous conditions across the United States on January 15, 2017, resulting in loss of life. GOES-16 scientists say the satellite will offer 3x more spectral channels with 4x greater resolution, 5x faster than ever before, leading to more accurate weather forecasting. Image via GOES Image Gallery. This 16-panel image shows the continental United States in the 2 visible, 4 near-infrared and 10 infrared channels on GOES-16’s Advanced Baseline Imager (ABI). These channels help forecasters distinguish between differences in the atmosphere, for example, between clouds, water vapor, smoke, ice and volcanic ash. Image via NOAA/NASA. 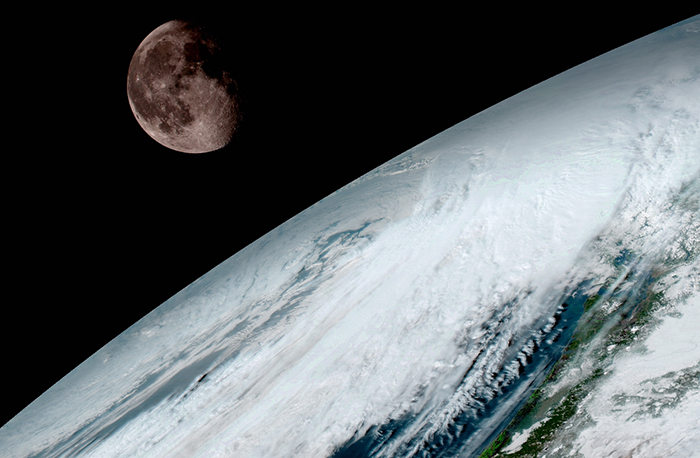 The GOES-16 Advanced Baseline Imager also acquired the images to make this composite color image of Earth. It’s from 1:07 p.m. EDT on January 15, 2017 and was created using several of the instrument’s 16 spectral channels . The image shows North and South America and the surrounding oceans. 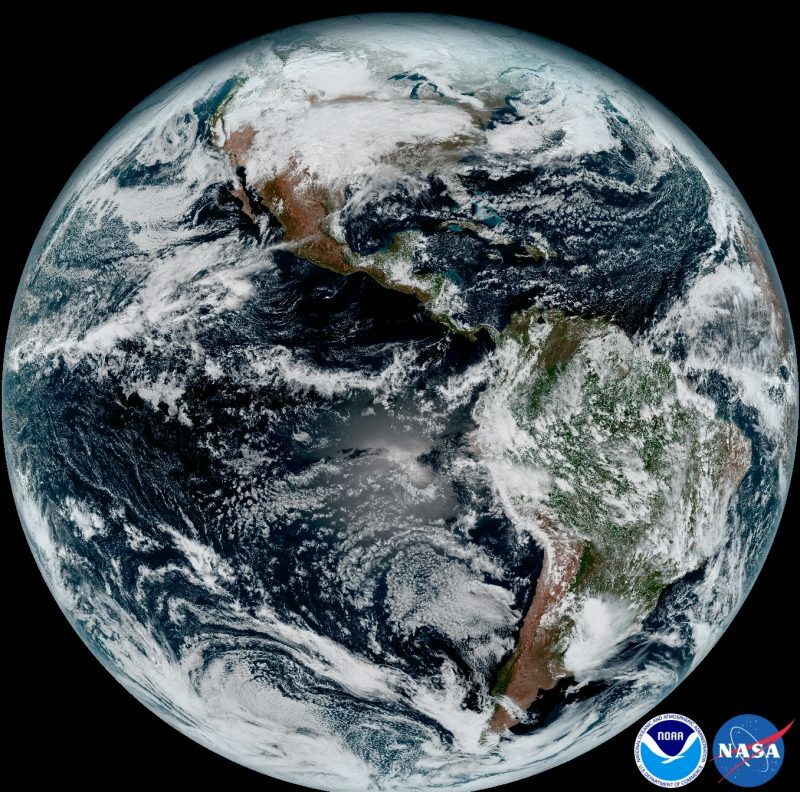 GOES-16 observes Earth from an equatorial view approximately 22,300 miles high (35,888 km high), which is why, NOAA said, it’s able to create “full disk images like these, extending from the coast of West Africa, to Guam, and everything in between.” Image via GOES Image Gallery. “Space weather impacts all those kinds of things,” says Douglas A. Biesecker, the chief program scientist for DSCOVR, based at NOAA’s Space Weather Prediction Center in Boulder, Colorado. “These are systems you and I don’t necessarily use on a day-to-day basis,” he tells Inverse, but they are critical for keeping our world spinning (figuratively speaking). DSCOVR resides in the very distant Lissajous orbit (about 930,000 miles away). It’s not the most well-known spacecraft orbiting the Earth, but it plays a critical role in helping scientists on Earth monitor space weather. As stated, the biggest concern about solar winds relates to power grids. 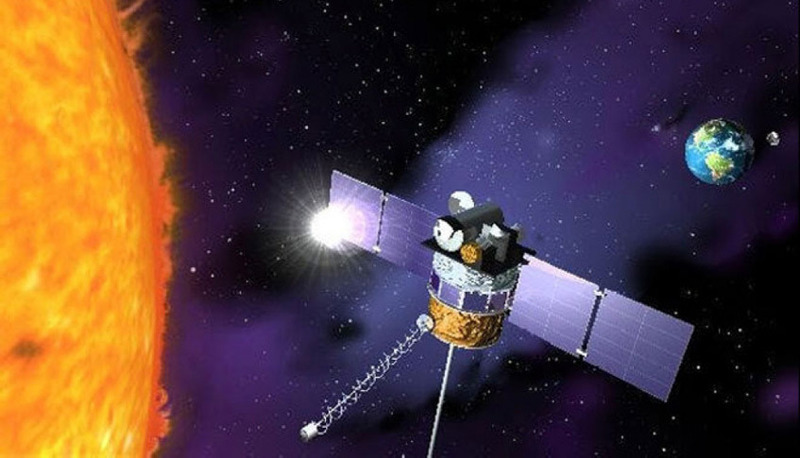 Space weather could damage critical transformers that move power across large distances at very, very high voltages, and scale that power down to something suitable for our home. If an aberrant space weather event were to knock out those transformers, “it could take years to replace them all,” Biesecker says. “We consider it critical to provide customers with the best quality forecasts in the mornings.” DSCOVR can see an event from the sun — which produces energetic phenomena traveling at about one to four million miles per hour — and warns us humans to make preparations to protect essential tools, instruments, and infrastructure. DSCOVR’s role as the world’s space weather meteorologist is all thanks to its Plasma-Magnetometer (PlasMag) instrument. “PlasMag provides us with data on the solar winds,” says Biesecker. “The magnetic field and its direction, and the solar winds’ speed, density, and temperature.” This is the information that helps inform NOAA what kind of warnings to send out to the public, as well as drive the models that illustrate how the planet is responding to these constant winds. In addition, Biesecker and other researchers are hoping to use DSCOVR for more ambitious forms of solar wind research. We’re delving so fast into new “atomic- scale physics”, like sampling shockwaves caused by coronal mass ejections “in very high detail,” he says. Besides that, however, DSCOVR has a couple other tricks up its sleeves. Two of its instruments, operated by NASA, have to do with observing Earth from such a far distance and providing a broader view of the planet and its activity. The Earth Polychromatic Imaging Camera (EPIC) takes photos of the full hemisphere of the sunlit side of Earth. “It’s why Al Gore was so interested in the mission,” says Biesecker. EPIC takes 12 “blue marble” images of the Earth every day. Blue Marble refers to an iconic photo taken during Apollo 17. It’s not just an inspiring view of the little rock we call home, but scientists can use these images to track weather patterns without having to stitch individual images together. A dozen different filters allow researchers to observe trends and movement in dust particles or pollution across the globe. 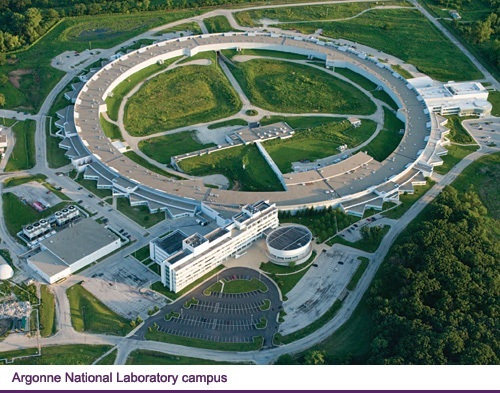 The last instrument is the National Institute of Standards and Technology Advanced Radiometer (NISTAR), which measures the energy being reflected by the sunlit side of the sun at any given moment. Scientists use this data to track how much radiation enters and exits the Earth’s climate system — an increasingly important data point in the face of climate change. Overall, DSCOVR is perhaps the most underrated essential space instrument used by NASA and NOAA. It’s a multitasking boss that gives us a heads up when the sun is getting a little violent, and provides us with no shortage of lunar photobombs. It’s precisely the type of thing experts and space-newbies alike can get behind. NASA has provided forecasters with a variety of data on the out-of-season tropical cyclone Alex. The AIRS instrument aboard NASA’s Aqua satellite provided valuable temperature data, the RapidScat instrument identified the strongest winds, the GPM core satellite provided rainfall rates and cloud heights, and NASA-NOAA’s Suomi NPP satellite provided a visible image of the storm. Alex officially became a hurricane on Jan. 14, 2016 at 11:00 a.m. Atlantic Standard Time (AST) with maximum sustained winds estimated at 85 mph by the National Hurricane Center (NHC), making it the earliest hurricane to form in the Atlantic since 1938, when the first storm of the season became a hurricane on January 4. As with Alex, that storm too originated from an extra-tropical low pressure center. The last hurricane to occur in January was Hurricane Alice in 1955, but Alice had already become a hurricane in the year before at the end of December and survived into January. NHC declared Alex to be a subtropical storm on Wednesday afternoon, January 13 when it was about 785 miles south- southwest of the Azores. Alex began from an area of low pressure that formed about a week ago along an old frontal boundary that was draped across Cuba. This low gradually moved out into the central Atlantic heading generally westward and began to produce thunderstorm activity as it started to curve northward toward the Azores. Often times, when extra-tropical storms acquire enhanced convection the instability is due to being over warm waters, but in Alex’s case it appears that the instability was due mainly to cold air aloft. At any rate, the heat release from these thunderstorms, which is known as latent heating, is what allowed Alex to eventually transform into a hurricane. The Atmospheric Infrared Sounder or AIRS instrument that flies aboard NASA’s Aqua satellite measured temperatures in Hurricane Alex’s cloud tops on Jan. 14 at 1429 UTC (9:29 a.m. EST). AIRS provides valuable temperature data for tropical cyclones such as cloud top and sea surface temperatures. The AIRS instrument aboard NASA’s Aqua satellite saw cloud top temperatures colder than -72.6F (-58.1C) (in purple) in thunderstorms around Alex’s eye on Jan. 14 at 1429 UTC (9:29 a.m. EST). AIRS saw strongest storms with cloud top temperatures colder than minus 72.6 degrees Fahrenheit (minus 58.1 degrees Celsius) around the eye. NASA research has shown that storms with cloud tops that cold are powerful enough to generate heavy rain. On Jan. 15 at 6 a.m. EST, RapidScat saw Hurricane Alex’s strongest winds affecting some islands in the Azores. Strongest winds were (red) north and northwest of the center at 30 meters per second (67.1 mph/ 108 kph). Maximum sustained winds are not always equally distributed in low pressure areas and the RapidScat instrument helps forecasters find the strongest quadrants of a storm. Tropical storm force winds extend outward up to 460 miles (740 km) from the center. RapidScat is a NASA instrument that flies aboard the International Space Station. The Global Precipitation Measurement or GPM core observatory satellite flew directly above hurricane Alex on January 15, 2016 at 1151 UTC (6:51 a.m. EST) collecting data in a rainfall analysis. Alex was moving into the Azores as a category one hurricane with maximum sustained winds estimated at 70 knots (80.5 mph). GPM’s Microwave Imager (GMI) and Dual-Frequency Precipitation Radar (DPR) found that rainfall intensity had decreased significantly since Alex was declared a hurricane on January 14, 2016. Most of the rainfall measured by GPM on Jan.15 was measured at less than 20 mm (.8 inches) per hour. GPM found that maximum storm top heights northwest of Alex’s cloudy eye were found to reach altitudes of 9.9 km (6.1 miles). Most of the rainfall measured by GPM’s DPR was measured at less than 20 mm (.8 inches) per hour. Also GPM’s radar (DPR Ku band) found that storm top heights were fairly low. The maximum storm top heights northwest of Alex’s cloudy eye were found to reach altitudes of 9.9 km (6.1 miles). At 7 a.m. EST (1200 UTC) on Friday, January 15, 2016, Alex was still a hurricane with maximum sustained winds near 75 mph (120 kph). It was located near 28.0 north latitude and 26.9 west longitude, just 50 miles (80 km) south-southeast of Terceira Island in the Central Azores, and about 105 miles (170 km) east-southeast of Faial Island in the Central Azores. Alex was moving to the north at 24 mph (39 kph) and had a minimum central pressure of 986 millibars. The National Hurricane Center stated that satellite and surface data indicate that Alex made landfall on the island of Terceira around 915 AM AST (1315 UTC) as a tropical storm with an intensity of 70 mph (110 kph). The Visible Infrared Imaging Radiometer Suite (VIIRS) instrument aboard NASA-NOAA’s Suomi NPP satellite captured a visible light image of Hurricane Alex at 14:20 UTC (9:20 a.m. EST) on Jan. 15 while it was moving through the Azores. The image showed that the eye had become cloud-filled and bands of thunderstorms continued to circle the center of the storm, mostly in the western, northern and eastern quadrants. 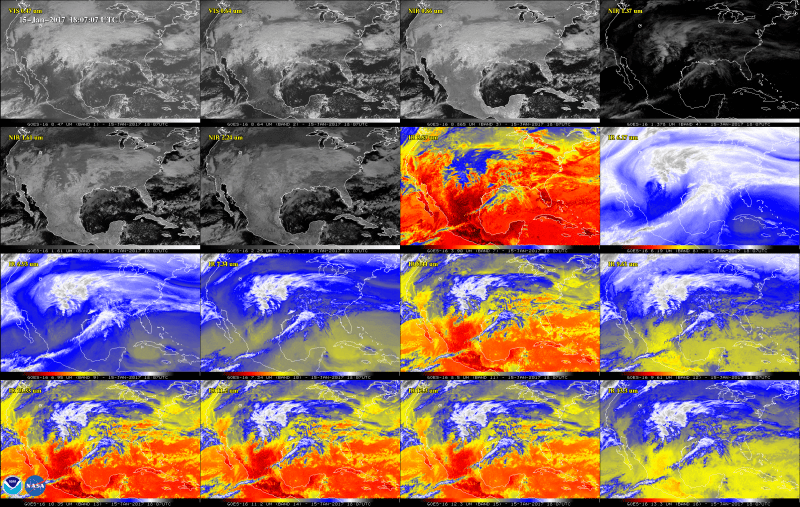 VIIRS collects visible and infrared imagery and global observations of land, atmosphere, cryosphere and oceans. Alex continues to accelerate and a gradual turn to the northwest is expected. On Jan. 15 Forecaster Pasch of NOAA’s National Hurricane Center said that the post-tropical cyclone is forecast to merge with or become absorbed by another extra-tropical low within two days.